Please take great care when deciding which material to purchase for your new body jewellery, as many types are not suitable for new (unhealed) piercings. 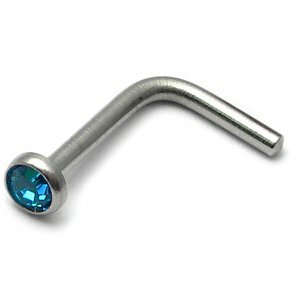 In addition, many types are unsuitable for piercings which are experiencing healing issues and/or those which are infected. 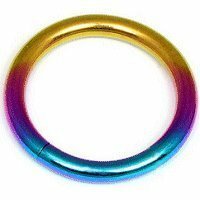 Below you will find an alphabetical list of body jewellery metals and materials and we have included lots of helpful information to assist you in making the right choice. Is yours a new (unhealed) piercing? Or is it currently troublesome or infected? 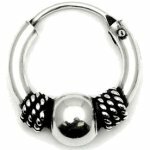 Choose metals/materials which are Suitable for both new (unhealed) and healed piercings. You should only choose Suitable for healed piercings only types if your piercing is fully healed and 100% healthy. That means no redness, no swelling, no lymph (gunk! ), no soreness, no bleeding, no bruising and no lumps. 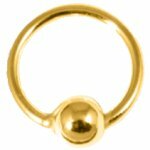 Even if your piercing is healthy, you should bear in mind that allergies to certain metals can suddenly develop or disappear at different stages of life. If that happens, you will need to discontinue use of that metal and try a different one. Acrylic is a synthetic material which is available in lots of different colours. Some acrylic jewellery has ultra-violet properties ('UV Acrylic') - this makes the colour jump to life when exposed to ultra-violet light. The versatility of acrylic allows for some great looks to be achieved. 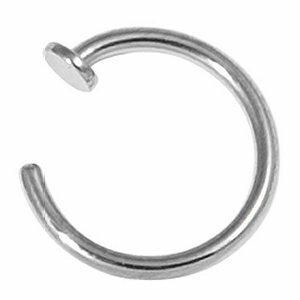 Acrylic contains microscopic pores which makes it unsuitable for new, unhealed and troublesome piercings. This is because lymph (a bodily liquid produced at the site of unhealed piercings) can become trapped in the pores. Once the lymph dries, a bond is formed between the acrylic and the skin. Breaking the bond cannot be done easily without causing harm to the skin. 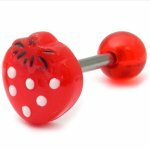 Suitable for both new (unhealed) and healed piercings. Bioflex and bioplast are flexible, biologically-inert materials, meaning that they do not initiate a response (or cause a reaction) when introduced to body tissue. Bioflex and bioplast, whilst not quite as soft as PTFE, move gently with your piercing: this in turn helps to reduce stress, inflammation and healing times. Bioflex and bioplast are ultra smooth and do not contain the tiny pores that other materials such as acrylic and steel do. Bioflex and bioplast are good choices for lip piercings in particular due to their soft, smooth disc at the back being much less abrasive against teeth and gums than a metal disc. 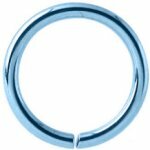 Bioflex and bioplast are also suitable for retaining piercings if you need to remove your metal jewellery for a hospital consultation or procedure, but do not want your piercing to heal up. Bone is lightweight, natural and each piece is absolutely unique. Where a pair is ordered at the same time, we always select two items which match as closely as possible. Bone jewellery has the added benefit of helping to reduce the odour sometimes associated with stretched ear piercings by absorbing oil and sweat around the piercing. Our bone products are a by-product of water buffalo which have already been killed for food. To prolong the life of your bone body jewellery, clean with mild soap and water and dry immediately, then oil with jojoba or grape seed oil on a monthly basis. It is advised to avoid prolonged exposure to sunlight, extreme heat or cold and sleeping or bathing with your jewellery in as this may cause it to crack or warp. Organic body jewellery should not be autoclaved or heat sterilised. Gold in its purest form (24 carat) is too soft to be used in most areas of jewellery creation. Therefore, to improve its durability, it is combined with other metals. The blending with other metals also helps to alter the colour of the gold (ie, yellow gold and white gold). Once the pure gold has been combined with the other metals, the resulting composition is referenced by 'carat' value (also known as 'ct', 'karat', 'kt' or 'k'). For example: 18 carat gold contains 75% pure gold (and 25% other metals), 14 carat gold contains 58.5% pure gold (and 41.5% other metals) and 9 carat gold contains 37.5% pure gold (and 62.5% other metals). All of our gold jewellery is solid gold, ie, our 14 carat gold jewellery is 14ct gold throughout. It is not just plated onto another metal (so, if you were to cut through the gold, you would simply find more gold!) On the contrary, we also have gold-plated jewellery in our range. To help you differentiate, our gold-plated jewellery is clearly indicated as such in both the product name and the product description (and if you managed to cut through gold-plated body jewellery you would see a different metal, most likely steel, on the inside). 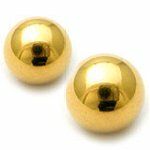 Gold-plated steel is achieved by electroplating a thin layer of real gold onto steel. 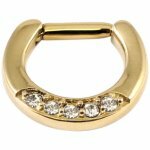 This produces a hard-wearing, high quality gold finish and makes an ideal low-cost alternative to a solid gold piece of jewellery. Because pure gold is a relatively soft metal, it is combined with other metals before electroplating to improve its durability. The resulting compositions are referenced by 'carat' value. For example: 18 carat gold contains 75% pure gold (25% other metals), 14 carat gold contains 58.5% pure gold (41.5% other metals) and 9 carat gold contains 37.5% pure gold (62.5% other metals). Gold-plated sterling silver is achieved by electroplating a thin layer of real gold onto 925 sterling silver. This produces a hard-wearing, high quality gold finish and makes an ideal low-cost alternative to a solid gold piece of jewellery. Because pure gold is a relatively soft metal, it is combined with other metals before electroplating to improve its durability. The resulting compositions are referenced by 'carat' value. For example: 18 carat gold contains 75% pure gold (25% other metals), 14 carat gold contains 58.5% pure gold (41.5% other metals) and 9 carat gold contains 37.5% pure gold (62.5% other metals). Horn is lightweight, natural and each piece is absolutely unique. Where a pair is ordered at the same time, we always select two items which match as closely as possible. 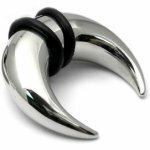 Horn jewellery has the added benefit of helping to reduce the odour sometimes associated with stretched ear piercings by absorbing oil and sweat around the piercing. Our horn products are a by-product of water buffalo which have already been killed for food. To prolong the life of your horn body jewellery, clean with mild soap and water and dry immediately, then oil with jojoba or grape seed oil on a monthly basis. It is advised to avoid prolonged exposure to sunlight, extreme heat or cold and sleeping or bathing with your jewellery in as this may cause it to crack or warp. Organic body jewellery should not be autoclaved or heat sterilised. 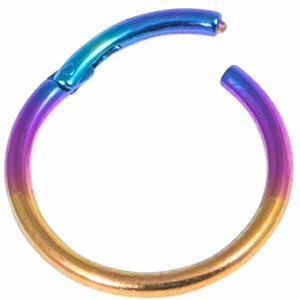 Our 99.9% grade niobium is suitable for unhealed piercings as per the EU Nickel Directive. Niobium resembles titanium, however it is more pliable (making it slightly easier to bend) and it is slightly heavier. In addition, niobium is slightly more expensive than titanium due to its specialised manufacturing process. 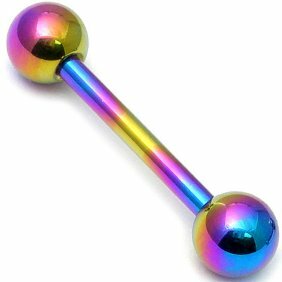 Like titanium, niobium is totally resistant to attack by body fluids which makes it suitable for new and unhealed piercings. Niobium colours are created in the same way as titanium - the metal is anodised to give a thin oxide layer. This layer is equally as bio-compatible and gives an even wider range of colours than titanium. The nickel content of niobium is less than 0.05%, therefore being ideal for those sensitive to nickel. PTFE (polytetrafluoroethylene, also known as Teflon) is a surgical grade, non-stick substance which is frequently used in surgical interventions such as cosmetic reconstruction. Because PTFE is biologically-inert, it does not initiate a response (or cause a reaction) when introduced to body tissue. 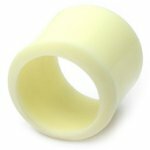 PTFE is soft and flexible, meaning that it moves with your piercing: this in turn helps to reduce stress, inflammation and healing times. It is especially effective for tongue piercings. 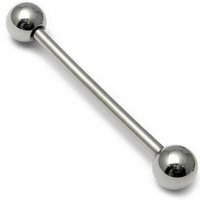 The flexible nature of PTFE makes it popular in navel piercings for women during pregnancy. 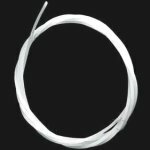 PTFE is also suitable for retaining piercings if you need to remove your metal jewellery for a hospital consultation or procedure, but do not want your piercing to heal up. PVD Black on Steel is a metal finish achieved via a Physical Vapour Deposition (PVD) process. This should not be confused with plating, which is different. During the PVD process, steel is used as the base metal, whilst the black colour is achieved using a Titanium Aluminum Nitride (TiAlN) compound. A high voltage current is passed through the titanium compound emitter in a hot and high pressure kiln. The result is a low-friction, low-allergy, high shine piece of black jewellery, with a tough scratch-resistant finish. PVD Black on Titanium is a metal finish achieved via a Physical Vapour Deposition (PVD) process. This should not be confused with plating, which is different. During the PVD process, bio-compatible titanium is used as the base metal (hence this metal type being suitable for new and unhealed piercings) whilst the black colour is achieved using a Titanium Aluminum Nitride (TiAlN) compound. A high voltage current is passed through the titanium compound emitter in a hot and high pressure kiln. 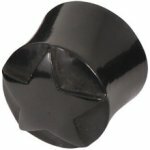 The result is a low-friction, low-allergy, high shine piece of black jewellery, with a tough scratch-resistant finish. PVD Gold on Steel is a metal finish achieved via a Physical Vapour Deposition (PVD) process. This should not be confused with plating, which is different. During the PVD process, bio-compatible steel is used as the base metal, whilst the gold colour is achieved using a Titanium Aluminum Nitride (TiAlN) compound. A high voltage current is passed through the titanium compound emitter in a hot and high pressure kiln. The result is a low-friction, low-allergy, high shine piece of gold-coloured jewellery, with a tough scratch-resistant finish. PVD Gold on Titanium is a metal finish achieved via a Physical Vapour Deposition (PVD) process. This should not be confused with plating, which is different. During the PVD process, bio-compatible titanium is used as the base metal (hence this metal type being suitable for new and unhealed piercings) whilst the gold colour is achieved using a Titanium Aluminum Nitride (TiAlN) compound. A high voltage current is passed through the titanium compound emitter in a hot and high pressure kiln. The result is a low-friction, low-allergy, high shine piece of gold-coloured jewellery, with a tough scratch-resistant finish. PVD Rose Gold on Steel is a metal finish achieved via a Physical Vapour Deposition (PVD) process. This should not be confused with plating, which is different. During the PVD process, steel is used as the base metal, whilst the rose gold colour is achieved using a Titanium Aluminum Nitride (TiAlN) compound. A high voltage current is passed through the titanium compound emitter in a hot and high pressure kiln. The result is a low-friction, low-allergy, high shine piece of rose gold-coloured jewellery, with a tough scratch-resistant finish. PVD Rose Gold on Titanium is a metal finish achieved via a Physical Vapour Deposition (PVD) process. This should not be confused with plating, which is different. During the PVD process, bio-compatible titanium is used as the base metal (hence this metal type being suitable for new and unhealed piercings) whilst the rose gold colour is achieved using a Titanium Aluminum Nitride (TiAlN) compound. A high voltage current is passed through the titanium compound emitter in a hot and high pressure kiln. The result is a low-friction, low-allergy, high shine piece of rose gold-coloured jewellery, with a tough scratch-resistant finish. Silicone is a synthetic material which is lightweight, soft and super flexible. It comes in a variety of different colours and you will find that it is durable, easy to clean and comfortable to wear. 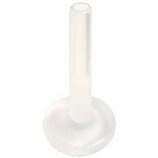 It's perfect for bedtime, and for those with stretched ear lobe piercings who wear helmets! 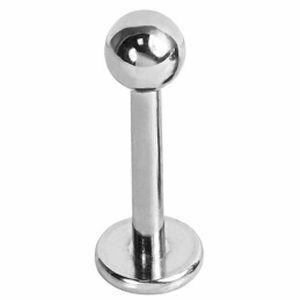 Stainless steel is a high quality metal with a bright, shiny finish. 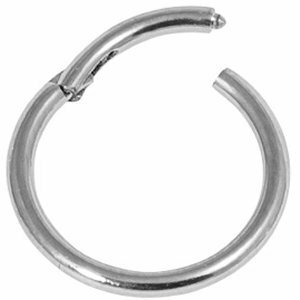 Within the EU, 316L stainless steel should not be used for initial (unhealed) piercings and should only be worn when the piercing is fully healed. Sterling Silver is an alloy containing 92.5% pure silver and 7.5% other metals (normally copper). This is because pure silver (99.9%) would be too soft and malleable to make jewellery. Instead, it is mixed with copper to give durability and strength. Sterling silver has a beautiful shiny finish which is easy to polish. Some sterling silver jewellery features blackened detail which gives a vintage effect - to achieve this, silver sulfide compound is used together with an oxidizing process. 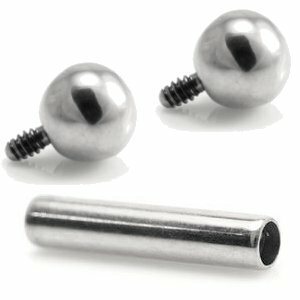 The nickel content of titanium is less than 0.05% by mass, therefore making titanium perfect for new piercings, troublesome piercings and for those sensitive to nickel. Titanium is bio-compatible and is used extensively by British and American medical associations for implants due to its total resistance to attack by body fluids. 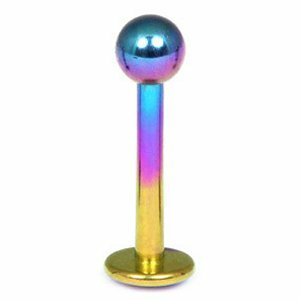 Titanium body jewellery is anodised using an electrolysis process which allows for an incredible range of eye-catching colours to be produced. 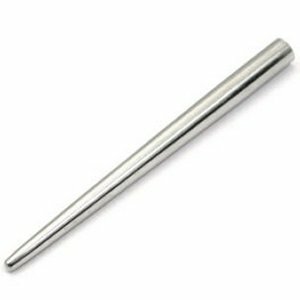 When taking into account that titanium is extremely lightweight, scratch-resistant, highly-polished and very tough (three times stronger than steel) it is no wonder that titanium is considered ideal for use in the manufacturing of body piercing jewellery. Wood is lightweight, natural and each piece is absolutely unique (where a pair is ordered at the same time, we always select two items which match as closely as possible). 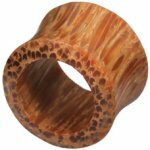 Wood jewellery has the added benefit of helping to reduce the odour sometimes associated with large gauge (stretched) ear piercings by absorbing oil and sweat around the piercing. To prolong the life of your wood body jewellery, clean with mild soap and water and dry immediately, then oil with jojoba or grape seed oil on a monthly basis. It is advised to avoid prolonged exposure to sunlight, extreme heat or cold and sleeping or bathing with your jewellery in as this may cause it to crack or warp. Organic body jewellery should not be autoclaved or heat sterilised.